In my over two decades and half of media and media related professional careers, I have encountered dozens of media relations' spokespersons in both the public and private sector. These persons have during these exhilarating encounters exhibited characters ranging from being professionally competent to the most absurd. I have met some who saw their briefs as attack dogs who only concerns themselves with nosing around for perceived adversarial materials for the purposes of only marketing their chief executive officers as near-infallible public office holders which at nest can only be found in a typical utopian setting far removed from existential realities. But i have also met refined and robustly focused professionals who run very open and accountable media reputational management departments and who treat researchers and media workers with the highest quality of courtesy. I have met some who care less about professional ethics of media reportage and so can do anything including hiring hatchet WRITERS to attack perceived opponents of their bosses. But there are those who believe in constructive criticism and feedback mechanisms that they busy themselves constructively putting out official positions that aren't so nakedly illogical to the hearing of the listening and reading public. As we all know, Nigeria being one of the fastest growing economies in the developing world, the urgency of the now to fashion out great brands and manage reputations of institutions and businesses remains the focal point of administrators of public and private institutions. Heads of institutions know too well that the media can both build them, make them and unmake them or demarked them. During my days as a full time newspaper reporter at both the regional and national platforms, I had the uncommon privileges of coming close to many media managers of government offices by the virtue of the fact that a dominant percentage of all business done in Nigeria are domiciled within and amongst public funded institutions. In terms of institutional strategic pride of place, the military is one of such publicly funded institutions that cares so much about its reputational management in the most efficient of ways. Over the past two decades, the military and indeed the Defence headquarters have had dozens of serving military officers who were delegated the duty of managing the media reputation of this establishment. The military of Nigeria has every strategic reason to remain adorable and respected in the eyes of the public because of the constitutional role assigned to them as the defenders of the territorial integrity of Nigeria. Integrity and credibility therefore are key words that the specific officials delegated the functions of spokespersons are charged to promote and protect. The military have a stake in fixing the broken perception of some Generals who had misused their high offices to help themselves from the public treasury. It is not strange to hear commentators blame the military dictators that took over political power in the past against constitutional tenets for the expansion of corruption amongst public office holders. General Abacha who governed Nigeria with brute force died many years ago but the public fund he looted from central bank of Nigeria are still being recovered from foreign banking jurisdictions where he concealed them. Also, the less than impressive role the military played in scuttling and then restoring democratic process and system of government in Nigeria means that all the segments of the Armed forces are expected to play by the rules of constitutional democracy by always striving to be the beloved peoples military of Nigeria. I must repeat that as a media professional, I have never truly seen any private or public institution that understands the role and place of the media than the Nigeria Army and/or the Armed Forces which is the reason for maintaining very elaborate and professionally administered media directorate. For these authors these are Media characteristics namely that "the media are human communication systems; the media use processes of industrialized technology for producing messages; the media generally aim to reach large audiences or to be used by many people and hence have been referred to as ‘mass media’ operating through ‘mass production’ leading to ‘mass communication’ their success is often built on popularity; the media usually aim to facilitate communication across distance (and/or time) between people, or to enable communication in which the sender does not need to be present as the communication in which the sender does not need to be present as the communication is recorded and then transmitted; the media are called ‘media’ because they are literally in the middle, or are the middle chain, of this communication (media means ‘middle’ in Latin), they are the mechanisms that connect the senders and the receivers of messages; the development of the media has been affected by commercial interests that recognize that the media are potentially highly profitable industries." 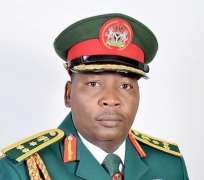 In the recent history up until only few days back, the Nigeria Army had a thoroughbred professional soldier and a good communicator as the spokesperson of that vital institution in the person of Brigadier-General Sani Kukesheka Usman. General Usman who was recently sent to school for further professional advancement by the chief of Army Staff Lieutenant General Tukur Yusuf Buratai and replaced by General Jude Ezecukwu, is a refined gentleman of the best qualities. A jolly good fellow who is loyal to the Nigeria Army and Nigeria to a fault. His tenure as the spokesperson of the largest Army in the black world humanized and transparently opened up that institution that was once seen as opaque and clandestine and he used his time richly to market that institution as peoples friendly and human rights friendly. Even when some of us in the civil society community disagrees with some of the tendencies of some operatives of the Army in the area of human rights enforcement and promotions, one character you couldn't take away from the ever smiling General Usman is the charisma and grace and also passion with which he proceeded with giving out the official sides of of every story. He took on so many battles in his determined effort to properly manage the reputation of the Army and the Chief of Army Staff who as a very strategic officer is always reported in so many ways from so much dimensions. Take the encounter of the Army with the members of the Zaria based Islamic movement of Nigeria or Shiites or the encounter with the unarmed members of the now proscribed indigenous people of Biafra, General Usman was always in top of his game speaking to present the official positions that are favourable to the Nigeria Army. Hate him or like him, General Usman was never found sleeping on his duties. He made his telephone lines available 24/7 to always respond to media inquiries. He remains one of the very few publicly funded media manager that can wake up by 1am to answer a call from a journalist just so he can defend his boss and the Army robustly. His office also punlishes beautiful and highly informative magazine stylishly called the Army magazine which seeks to humanize the perception of the Army as being friendly, open and transparent. He is a good spokesperson.. If not that he is a typical soldier whereby postings can be done at discretion of the Chief, one may be tempted to ask why such a great spokesman is being transferred to another beat. I concede to the right of the Chief of Army Staff to rejig his staff as best as he thinks for maximum performances. Usman reminds me of the characteristics of a great spokesperson identified in many seminal pieces. "Every organization, big or small, needs spokespeople who can promote its achievements and defend its reputation in a crisis." The author said the strength of these spokespeople has a huge impact on how their organization is covered by the media. "After all, there is a big difference between talking to the media and your customers and actually getting your key messages across effectively, gaining good coverage and protecting and enhancing your reputation." Adam Fisher said a spokesperson is the voice, and for television, the face of the business. "They have a vital role and businesses should have more than one." The writer asked, But what makes a good spokesperson? Is it a natural flair for public speaking? Or, perhaps, the confidence to think on their feet? To help answer that question, we asked five of our expert journalist tutors who deliver our media training courses to each list the top three things they look for in a spokesperson. For brevity, this writer will quote just one of such experts who listed out attributes that make for a great spokesman. From Lawrence McGinty – former Science and Medical Editor for ITV News: a great spokesperson must have Conviction. "Do they really believe what they're saying or are they just mechanically parroting a prepared script?" Secondly, a great spokesperson must represent a spark of something - humour, determination, apology - whatever emotion sits well with what they're saying. And lastly, a great spokesperson has humanity. "do they really care about people affected by the issues? Do they talk from personal experience? How will what they say be received by those affected? " General Usman possesses these great qualities. As i stated, one may not completely agree with the official versions that he dished out but he does the dishing so professionally well and much better than his colleaque who was then the Director of media in the Defence Headquarters Brigadier General John Enenche who lacks professional charisma and skills of a great spokesperson. *Emmanuel Onwubiko is the Head of the Human Rights Writers Association of Nigeria (HURIWA) and [email protected] ; www.huriwanigeria.com ; www. [email protected] .